March 2019: As part of their subject knowledge development, RE PG trainees partook in a subject knowledge development day, focusing on Islamic and Jewish teachings. They chatted to Hinnah and June about the Islamic and Jewish experiences within the faith living rooms. The trainees were given the opportunity to ask questions and address misconceptions, as well as increase their general knowledge about both faiths. Another Fantastic Taste of Life Course Completed! Our first Taste of Life course for 2019 was a resounding success! We engaged with 9 learners over a 4 week period and 8 volunteers helped us to deliver the course. We were lucky enough to work in partnership with Jo Bruce from the fantastic charity, Natural Breaks, yet again. We “visited” 8 countries and cooked 8 delicious and healthy meals from around the world. The feedback from the course was very positive, with everyone increasing their knowledge of faiths and cultures different from their own. We definitely succeeded in feeding our minds, bodies and souls with community spirit! This week the MIFYF participated in a Round Table Event (named so because, as Matthew explained, everyone is equal at a round table) at the St Aidan’s Centre and our own Home of Hospitality. 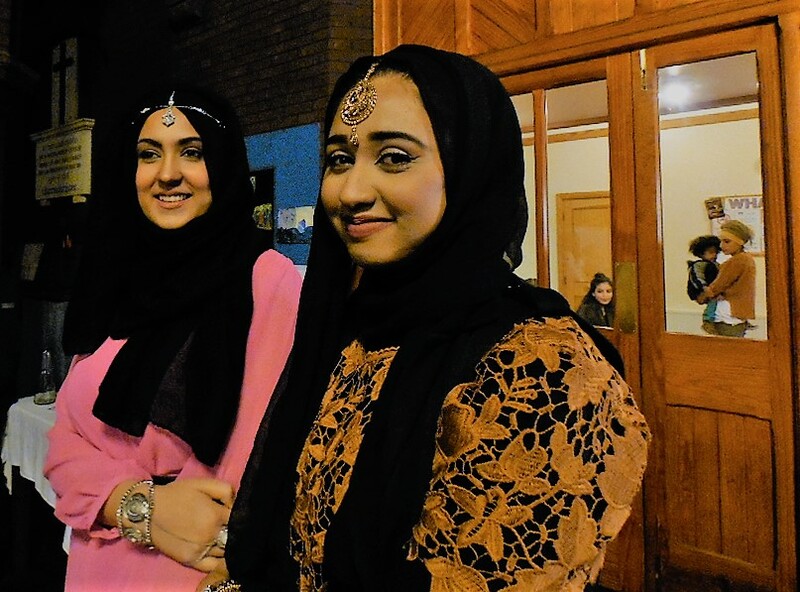 This amazing event was part of the ongoing project the MIFYF have been involved exploring British identity and Brexit with Dr Francis Farrell, Dr Shereen Shaw and Professor Vini Lander from Edge Hill University and Waqaus Ali from Faith to Action. The MIFYF were one of four groups involved in the project and it was a pleasure to finally meet the other groups, Lowton High school, Culcheth High School and the Abrar Academy. Discussions took place based around the young people’s hopes and fears, what they wanted to say to politicians today and how they felt Brexit would affect their future. It was truly fascinating hearing the insights of the young people from areas outside of Liverpool, and their perspectives on Britain today. After the Round Table discussions came to an end, we were treated to a lovely cultural lunch prepared by Alison and Cindy. Matthew and Hinnah then delivered their popular interactive At home with… workshops (Islam and Global Christianity) to the young people. Everyone got to taste some delicious freshly-roasted Ethiopian coffee prepared by our volunteer Jerusalem, as well as have an open conversation with Hinnah based around some the misconceptions surrounding Islam. Matthew ended the day with an interactive tour of Liverpool Anglican Cathedral. A massive thank you to Francis, Vini and Shereen for organising the event and to all other members and staff involved. We plan to build upon the fantastic discussions and wonderful insights gained by organising more events later this year. The first of what we hope to be a series of Welsh pilgrimages took place on 12th December. Following the ancient North Wales pilgrim’s route we visited Pantasaph Friary and Holywell. Carrying our pilgrim staffs (made on our workshops earlier in the year) we were welcomed into the Friary Brother Francis. We had requested that he would sing a favourite song but weren’t sure if he would be there or well enough. Fortunately Brother Francis was on form, sang the wonderful song and then added a second beautiful ballad about Mary, plus two brilliant jokes and some inspiring Franciscan wisdom. We walked up the Calvary hill and then set off for Holywell for lunch with the Bridgettine Sisters in their Guesthouse. Refreshed in body and spirit we set off for the ancient healing well and sampled the mystical spring waters before setting off back to the Pool of life. On Thursday 6th December we held our Annual Celebration in the new St Aidan’s Centre near our offices. It was a great event, attended by approx. 50 invited learners, volunteers, partners and supporters including our Lord Mayor, Cllr. Christine Banks. The evening began with Sara Radivan (one of or Jewish Steering Committee members) lighting the candle and singing the blessings for the fifth night of Chanukah, followed by Youth Forum member Sumaya’s prayer for peace. Awards were presented to acknowledge the great achievements of our learners and the invaluable help provided by our volunteers and partner organisations. We premiered the short film of our flagship Taste of Life C.H.A.N.G.E [programme for marginalised adults which Alison’s nephew Zach kindly made for us [see link below]. Entertainment was provided by Youth Forum member Reham who inspired us with her Arabic song ‘Salouni naas-Fairouz’, followed by Gary Murphy, a professional resident artist from the Cavern Club who kindly played for us three classic Beatles songs followed by Ferry Across the Mersey . Gary highlighted the lyric “We don't care what your name is boy We'll never turn you away” and generously reflected that this was a good summary of his experience of Liverpool Community Spirit. Finally we all tucked in to delicious curries prepared by Anise (Faz’s - our Youth Forum Chair– Mum), Hinnah’s Mum-in-law Rehima and our award winning volunteers Alli Devine and Cindy. 30.10.18. We took 12 of our Taste of Life CHANGE course graduates to the famous Princes Road (Old Hebrew Congregation) Synagogue in Liverpool 8. Our friend and Jewish community volunteer Denis Salamon gave us a fantastic tour of this spectacular star of Liverpool heritage. He unveiled for us the history of Liverpool’ Jewish community and its national and international importance. Our learners were so engaged that the planned 45 minutes turned into an hour and a half of exploration and wonderment. Another of our Refreshing C.H.A.N.G.E. activity programmes for our adult learner graduates have been making traditional pilgrim staffs. Over a six week period 7 Taste of Life graduates worked in our garage workshop crafting their own, personalised pilgrim staffs from ash rods harvested from St James’ Gardens (thanks to the Friends of St James’ Gardens for their permission and support). Weekly meetings also included reflections on John Bunyan’s classic book Pilgrim’s Progress. The programme ended with a pilgrim walk to Hilbre Island which included a picnic, reflections on the faith and support we need to get through tough times in life and then recording three oppressive forces that can hinder our progress and their opposites which help us get back on track. We literally threw away the oppressive forces into the ocean and returned with the positive forces in our pockets as helpful reminders for the future. Refreshing C.H.A.N.G.E: Our ongoing learning and development programme for graduates from our Taste of Life C.H.A.N.G.E. course: South Indian Orthodox culture and cooking 09.10.18. Today two members of Liverpool’s growing South Indian Orthodox Christina community, Linz and Sony Aiynattu led a workshop to share their rich cultural heritage. They showed us how to make a traditional meal from Kerala: Nadan (local) fish curry, rice and chapattis, followed by Semiya (vermicelli) Payasam pudding. We were all inspired by the culinary skills of Sony and Linz and then blown away by the unbelievably delicious taste of the dishes. Only the best fresh ingredients were used. Linz then shared some of the uniquely ancient history and practices of South Indian Orthodox Christian worship and practice, all brought alive by the beautiful artefacts he had brought from their Church (St James in West Derby). We will be trying out the Semiya Payasam with our Taste of Life CHANGE learners at HMP Risley this Friday and can’t wait to see their response. Massive thanks to Linz and Sony: our thoughts and prayers are with your kinsmen in Kerela. Another Refreshing C.HA.N.G.E. activity: we took a group of adult learning graduates on a fascinating tour of the Abdullah Quiliam Heritage Centre and mosque at Brougham Terrace. We were blown away by the progress that has taken place since our last visit. So many wonderful features and such an inspirational vision, Massive thanks to our friend Mumin Khan who really opened our eyes to this vital part of Liverpool heritage which is being so tastefully and thoughtfully renovated for the benefit of all. 8th October 2018: In the third of our series of cultural hospitality events, our Youth Forum members planned and hosted traditional Arabic (Yemeni flavoured) tea party. Sumaya, Selma and Reham gave talks about aspects of Yemeni culture, including dress, food and music. They also prepared delicious Yemen tea and cheese pastries. Hinnah helped by Roxy revealed the importance of hospitality in Islamic tradition and gave insights into the use and symbolism of dates. We divided into pairs, a young person and an elder, to engage in conversation and then reported back on what we had discovered about our paired partner. Three new Youth Forum members joined us for this session: Sandra, Reshma and Sneha all from Liverpool’s South Indian Orthodox community. The session ended with a magical Yemeni song which Reham sang acapella and with such skill and enchantment that everyone was captivated. On Thursday 6th September we had a fabulous day out with members of our Taste of Life Groups. 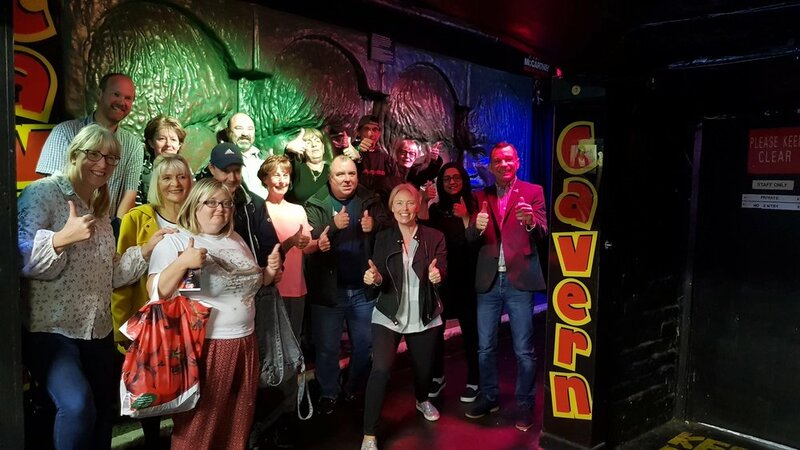 It was our 6-month reunion and evaluation session and we took the opportunity to learn more about the Beatles and the Cavern Club and eat some excellent food at the new Festival Food and Drink Restaurant on Mathew Street. We are indebted to Cavern City Tours for sponsoring this event. We started off the day at LCS having tea and coffee and catching up and then went down to the Cavern Club. We were welcomed warmly by the staff there and given a VIP area to sit in next to the live music stage. The wonderful Gary Murphy entertained us with his fantastic guitar playing and singing and we spent the next hour dancing and singing to Beatles music and having a lot of fun. We were then given a really informative and interesting talk by Nick Robinson of Cavern City Tours about the history of the Club and all about the amazing musicians that have played there over the years. By this point we were all starving hungry, so we made our way over to Festival, where we enjoyed a delicious late lunch. This is us, pictured below, having fun in the Live Lounge at the Cavern Club, the most famous Club in the world! On Tuesday 4th September, we hosted 16 members of staff from the charity Stick n Step for a Faith Diversity Awareness Training Day. This is a wonderful charity whose staff work with children with cerebral palsy. They use a method called Conductive Education and this means that all of their education sessions include social interaction, music, games and singing, for example, with the aim of focussing on what the children CAN do, rather than what they cannot. They have centres in Runcorn and Wallasey. The aim of the training day was to increase staff awareness, understanding and confidence about working with people from diverse faith communities. Throughout the day we held sessions on Christianity, Islam and Judaism and we were very fortunate to have as our volunteer from the Jewish community, Dennis Salamon, who facilitated the “At Home with Judaism” session. We also provided a homemade “cultural” lunch which included traditional Ethiopian and Jewish dishes. Some of the ingredients were provided by John Taggart, another of our volunteers, from his allotment. Thank you John! “understanding that many faiths have a wide spectrum where the practice of worship varies e.g. one Muslim/Jew is not identical to another”. Another successful and enriching day for Liverpool Community Spirit! As part of our programme to ensure graduates from the Taste of Life CHANGE course maintain and develop the progress they made, we continue to provide a series of post-course workshops. A group of seven graduate learners signed up for our staff making workshops. These have been supported by Taste of Life CHANGE graduate John Taggart, who has taken on the role of volunteer tutor/mentor. Personal reflections have focused on the theme that we are pilgrims in this life (‘just passing through’) and have been inspired by John Bunyan’s classic book and also the departure from this life of our dear friend Henna Al Rashid. Henna was one of LCS’ first volunteers who became our Islamic Good-will Officer in 2002, contributing to numerous school workshops and also our Youth Council activities. Henna is pictured wearing her white hijab below at one of our more recent hospitality workshops. Inna lillalhi wa inna ilaeyhi raja’iun. In August we delivered two faith diversity awareness days for nine intending teachers who will be starting their full teacher training programme in Religious Education this month. The first day included an exploration of key beliefs, practices and diversity within the Christian faith. This took place in our Ethiopian Orthodox living room and was followed by guided tours of our two magnificent Cathedrals. 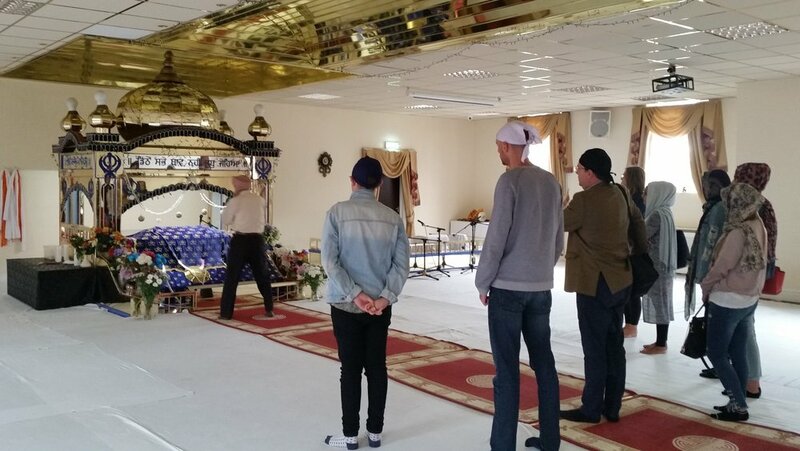 The second day focused on the Sikh faith and community and included a guided tour of the Merseyside Gurdwara with our good friend Mr Hardev Sohal. Our Inter-Faith Youth Forum had an amazing day at the Quwwat Ul Islam Mosque in Preston. Hosted by Waqaus Ali and students from the Abrar Academy We engaged in fruitful discussions about British identity and values, followed by a delicious biryani meal, a talk on sunna food (foods recommended by the Prophet Muhammad s.a.w.) and a wonderfully lively and open Q and A with Imam Mohsn. After a final reflection session we were presented with biryani take-aways and headed back to the Pool, filled, refreshed and inspired in body, soul and spirit by the warmth, friendliness and sincerity of our hosts. Massive thanks to Waqaus and his team and to Francis Farrell and Shereen Shaw from Edge Hill University who helped fund and organise this fantastic day. Tuesday 5th June: Last night in our Islamic living room, Muslim members of our Youth Forum hosted another iftar fast-breaking meal for their non-Muslim members and also invited guests from the local Jewish and Christian communities. We shared our food and our experiences and insights into the nature and benefits of fasting. Our Jewish guests brought some delicious kosher sandwiches and Sumaya made her speciality custard pudding to add to the feast. A fantastic time was had by all. Alhamdulillah! Thursday 31st May: Today we were blessed with a very special award from the Josephine Butler Memorial Trust. This was in recognition for our work promoting community cohesion. Following a special Eucharist in the Cathedral Lady Chapel and a buffet lunch in the Western Rooms, the Trust’s Chair, Pauline Lewis presented us with a cheque for £5,000. It was such an honour to receive this award in memory of a Liverpool Lady who was such a pioneer for social justice and a true embodiment of Liverpool Community Spirt. Our sincere thanks go to all the Trustees. Pictured above: Roxy Miah and Fazilat Paracha, our Senior Inter-Faith Youth Forum members; LCS Chair Sylvia French, Matthew and Hinnah. Volunteers Cindy Rigby and her granddaughter Jess also joined us for the occasion. We were delighted to receive flowers, biscuits and a thank you letter from the women who attended the Taste of Life C.H.A.N.G.E. course that we delivered in Styal Prison during April and May of this year. Matthew and Alison delivered the accredited course to 6 women who all passed the course with flying colours and received certificates from Open Awards. We were ably assisted by several volunteers who attended some of the sessions, such as Cindy Rigby, Eyerusalem Lee and Colette Borrow, who all gave up their own time to help us and them, as well as Hinnah who taught them all about Islam as well as providing administrative support in the office. This course is funded by the Big Lottery and has been very well received by prisoners, staff and inspectors. "How to start forgiving myself and look forward to a positive future." "What I want and where I want to be." "What my core values actually are. It encouraged me to think specifically about these." Four of our Muslim Youth Forum members, together with staff and our Ethiopian volunteer, Woine, invited six elders from the local Toxteth community for Ethiopian Coffee morning on the auspicious occasion of the Birthday of Mariam (Our Lady Mary). We demonstrated traditional Ethiopian Christian hospitality tradition of welcoming the stranger into the home, preparing and serving freshly ground coffee with fandisha (popcorn) and delicious Ethiopian Tekorat bread cake which Woine made and which traditionally is served as part of this festival day in Ethiopia. Our Youth Forum members and staff were paired up with an elder for conversation. We then shared what we had discovered about our paired partner. Hinnah then read the famous passage about love from St Paul’s letter to the Corinthians. Conversations continued and people were reluctant to leave the friendly and intimate spirt of fellowship that had been created. We are looking forward to or next Youth Forum event which (God willing) will be an Iftar fast breaking hosted by our Muslim Youth Forum members for our Jewish and Christian neighbours. Big Lottery Fund and Liverpool City Region chiefs visit LCS - 18.04.18. Amongst the numerous BLF funded projects in our region, we were chosen as the one that the senior figures wanted to witness as part of a special day of encounters between the leaders of the BLF and Liverpool City region. Visitors: Dawn Austwick: Chief Exec of BLF; Steve Rotherham: Metro-Mayor LCR (L’pool City Region); Paula Williams: (Knowsley Metropolitan Borough Council) LCR Cultural Partnership and Strategy lead; Eric Robinson, Chief Executive of Wirral council and the city region lead officer for culture; Phil Davies, Leader of Wirral Council; Jenny Rowse, Head of Funding BLF and Alice Irvine, BLF Funding Manager for Merseyside and Cheshire. LCS Chair Sylvia French and former Chair, James Hernandez, welcomed the guests into our Home of Hospitality and took them into our teaching room. Sitting around the famous Liverpool Round Table of Faiths, Matthew used the table and our LCS flag to illustrate our aims and values. Upstairs the group experienced our Ethiopian cultural living room, tasting some of our interactive cultural/faith learning activities. Our Ethiopian volunteer, Jerusalem, demonstrated traditional Ethiopian hospitality including hand-washing, traditional coffee and fandisha (pop-corn). Ably facilitated by our BLF programme Co-ordinator, Alison, four of our adult learners, Lewis, Jeanette, Katrina and Cindy kindly shared their experiences of our Taste of Life C.H.A.N.G.E programme, its benefits and positive impact on their lives. Our guests then moved into our Islamic living room where Hinnah gave them a taste of one of our “At home with Islam” workshops. Hinnah outlined the successes of our schools and our teacher training workshops in Religious Education. Our dynamic Youth Forum members Faz and Roxy spoke about the work of our Inter-Faith Youth Forum. We welcome all people and give them some fare. We’ll cook and we’ll natter and show you we care. Dawn Austwick, Chief Exec of BLF, gave a vote of thanks on behalf of all the visitors, declaring that what they had experienced at Liverpool Community Spirit made all their jobs worthwhile. Spring Social Action: Our Inter-Faith Youth Forum have chosen to do a series of an inter-faith/cultural hospitality events for local elders. They delivered their first event as their contribution to the Sadaqa day initiative. 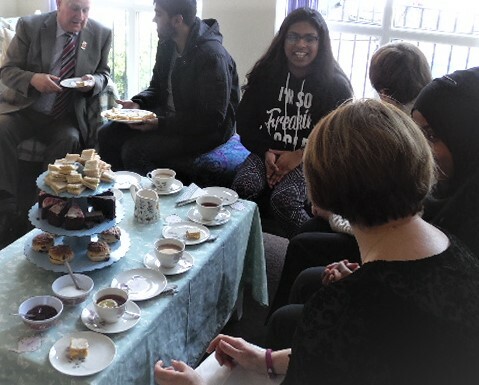 Five Muslim inter-Faith Youth Forum members hosted English afternoon Tea for 5 local elders from local diverse Christian communities (Catholic, Anglican and Free Church) in our Jewish Living room. We began with a welcome introducing the meaning and importance of hospitality in all the Abrahamic faiths, a multi-faith grace, conversations in pairs, an explanation of the origins of English afternoon tea, a quiz and then sharing things that we had discovered about our partners. Youth Forum members presented their elder with a teapot card with an explanation of the history of Afternoon Tea and a list of traditional Dos and Don’ts. We have completed the first two full runs of our new Taste of Life C.H.AN.G.E course. This was a great success. The learners loved the activities including the two new cultures that we explored: Jamaican and Irish/Scouse. Our new resources, including the individual learner boxes were greatly appreciated. We start the next C.H.A.N.GE. programme runs in HMP Risley and HMP Styal in April. Tuesday 13th Feb: Ninety (yes, 90!) Primary School teachers participated in the Faith Carousel we delivered for the Learn Teach Lead R.E. Wirral Schools’ Hub. Denis (Judaism), Gogden (Buddhism) Hinnah (Islam) and Matthew (Global Christianity) all talked about how their faith is lived out, providing ideas and support for how to teach about their respective faiths. We were joined by Sophie who shared perspectives and resources from the Humanism UK organisation (f.k.a. the British Humanist Association). We were really impressed by the high number and the enthusiasm and commitment of the teachers, all of whom had travelled from a hard day at school to take part (please take note DfE!). We are into the second week of delivering our new Taste of Life C.H.A.N.G.E course and we are loving it! We were incredibly fortunate to be awarded a Big Lottery Reaching Communities Grant last year which will enable us to run this new programme for three years. The first two runs of the course we are delivering here at base and future courses will be delivered at HMPs Styal, Risley and Liverpool. On December 7th we held our Annual Celebration, where we get the opportunity to celebrate and give thanks to all the people who have helped us deliver all of our activities throughout the year. It was amazing to look back and realise how much we had achieved and how many people we had reached. We had a lot of fun and ate some amazing food. 23rd Nov: Today we had the first meeting of our new Merseyside Inter-Faith Youth Forum [MIFYF]. The group will be co-ordinated by our two senior Youth Council members: Faz Paracha and Roxy Miah and in fact it will take over from the Youth Council. We had a great ‘get to know each other’ meeting, using our famous Altar. They brought in personal objects to express their identity and share it with the group. MIFYF will be launched at our Annual Celebration on 7th December in the PAL (a.k.a. Pakistan) Centre. It will begin its formal work next year. Members also chose a practical community activity to support, namely supporting Alder Hey children’s hospital in its inter-faith work. 16th November: Matthew, Hinnah and Kelsang Gogden (our lovely Buddhist volunteer) drove down to Manchester Metropolitan University in Crewe to deliver a Faith Carousel workshop. It was organised by Chris Cooney of Brine Leas High School who is also hub leader for the Cheshire West hub. This was an opportunity for trainee teachers and local teachers to ask questions about teaching difficult aspects of faith in a safe and friendly environment. 31st October: We had an amazing day out at the new British Music Experience which is inside the Cunard Building on the Pier Head. 20 of us went, funded from the Healthy Liverpool Community Grant Scheme. Colette Borrow was our volunteer. We were treated to a workshop from the museum’s brilliant education staff and then had a tour round the building, which is amazing. We had a packed lunch and also had a chance to try out some musical instruments. This was a brilliant addition to the Cultivating Community Spirit programme. 13th October: Today we had a lot of fun cooking a delicious Jamaican dish and learning about the Jamaican culture. Karen Gibbs (one of our volunteers) led the session with Alison. Once the cooking was done, Karen taught us some traditional Jamaican dancing. We sang the national anthem and two Jamaican songs; Linstead Market and Manuel Road. This worked up quite an appetite and we all tucked in to the delicious food. 18th September: Today our Steering Committee member, Moner brought along 15 members of the Liverpool Arabic Centre to experience our “At home with (Ethiopian) Christianity” workshop. We built upon the great example of inter-faith friendship and hospitality when the Prophet Muhammad (PBUH) sent his followers to the Ethiopian Negus (Emperor) for shelter and protection from persecution. They received a warm welcome and experienced some true Christ-like hospitality for many years. This generated a mutual respect that facilitated some of the first and most positive Muslim-Christian dialogue. Matthew used artefacts from the Ethiopian Orthodox Tawehedo Church to explain some key concepts of Christian belief and values. He was helped by two of our Ethiopian volunteers, Freyewot and her daughter Mahalet. This was a wonderful evening. Everyone opened their hearts in a spirit of sincere courtesy and genuine friendship. True community spirit! We are all so excited to announce that we have been granted three years funding from the Big Lottery Reaching Communities Fund, amounting to £293,503. This is fantastic news and will allow us to expand the impact and reachof our adult learning programmes supporting marginalised adults across Merseyside. So far we have had two amazing sessions with our lovely tutor Alison and the volunteers. The theme for the first session was Arabic/Islamic. We cooked a delicious Arabic dish called Haneath and baked a date cake. We also made and some Arabic lemonade - so fresh and revitalising! Hinnah did a very insightful session on Islam using our Muslim living room, we learnt lots about her practices and beliefs. The theme for session two was Judaism. Matthew took us to the Jewish living room where he learnt lots about Jewish beliefs and practices and had a look at some of the artefacts. We learnt a knew song called Shalom Aleichem and tried on some Jewish clothing. We have been painting our pot with our own unique designs and next week we will be planting it. We had another lovely day out with our friends from Natural Breaks on Friday 19th August. This time we decided to investigate what lay under the ground in the nearby Williamson Tunnels. A group of us were given a very informative tour by one of the lovely volunteers, Pat, who told us all about the history of the Tunnels. This is a unique place and one well worth visiting. We all had to wear hard hats! On Friday 30th June, we had a "magical" day out with our friends from Natural Breaks. About 15 of us got on a minibus and did a Beatles Tour of Liverpool, stopping off at Penny Lane and Strawberry Fields. This was a day out for people who had previously attended one of our Cultivating Community Spirit Courses. We ended up in Mathew Street at the Cavern Club. Grateful thanks to Cavern City Tours for sponsoring this trip. We had a "fab" time! Our wonderful Magical Mystery Tour. 5th June: Last night our Youth Council members shared Iftar and the delights of Ramadan with members of our Jewish community (including the Chair of the Merseyside Jewish Rep Council and two of our Steering Committee members) and our new neighbours (Ed and Zoe) who moved in next door and will be working in St James in the City church. 1st June: Our friends at Britain’s top coffee roasters: Neighbourhood Coffee provided an amazing coffee tasting tour for our adult learners at their base in Chadwick St Liverpool 3. We were welcomed with delicious coffee made by the barista trained staff, given a very informative tour showing how coffee is grown, imported, roasted and packed. It was great to see how Neighbourhood Coffee have such a direct, personal and ethical approach to their coffee farmers in developing countries. We then went on to coffee ‘cupping’: sampling six of their amazing quality coffees from around the world. Great to see a Liverpool company at the cutting edge of coffee roasting and demonstrating how sound business and true community spirit make an irresistible blend. 16th May (Session 4): On the menu today was shepherds pie and apple crumble. This was cooked by the lovely ladies from St Anne & St Bernard's Church, our Muslim ladies also helped with the preparation and certainly enjoyed eating it for lunch. We had a lovely discussion on Christianity which included the role of Priests and the Pope. We are sad that this is our final session - ladies please stay in touch! Thank you to everyone involved and a big thank you to the Near Neighbours Project for funding this project. 10th May: We took some ex-learners to Liverpool Cathedral where Matthew gave us a very insightful tour of Britain's biggest cathedral - we learnt so much. Alison then took some of the learners to the top of the tower, the weather was perfect and the view was AMAZING! We ended the trip with a picnic in St James' Gardens. 9th May (Session 3): After the success of yesterdays session, we held another At Home with... session today. We invited women from St Anne & St Bernard's Church's well as Hinnah's mother-in-law and husband, they taught us about Afghan culture and delivered a session on Islam using our Muslim living room. We cooked a delicious Afghan kebab with rice which we enjoyed in the sun. 8th May (Session 2): Today we learnt lots about Somali culture including food, clothes and the history of the country. We even managed to hold a little fashion show to showcase the Somali clothing. The food was DELICIOUS!! Ethiopian Cultural Evening - Wednesday 3rd May: Father Birhani and Deacon Dagmawi reveal the mysteries of the Begena (sacred drum) and teach us a traditional song of praise. Afterwards we shared delicious ambasha bread freshly baked by Fr Birhani’s wife. Igziabhir yemesgen! Friday 31st March (Week 2): Indian/Islamic themed session. Learners cooked a delicious Arabic dish called Haneath and baked a date cake. Arabic lemonade was also on the menu - perfect for the lovely weather. Hinnah delivered a session on Islam using our Muslim living room, we learnt lots about her practices and beliefs. Near Neighbours - At Home with..
21st March (Session 1): Today was brilliant day as we started a new course funded by the Common Good Fund. Members of LCS Youth Council divised themselves into 2 groups, American members and Muslim members. Each group cooked a dessert, chocolate chip pancakes and potato latkes, with help of Sara Radivan. We learnt a lot about each others cultures and can't wait fort he second session. Thursday 29th March: First year Teacher Trainees were welcomed into our Home of Hospitality where they received four different workshops related to RE. 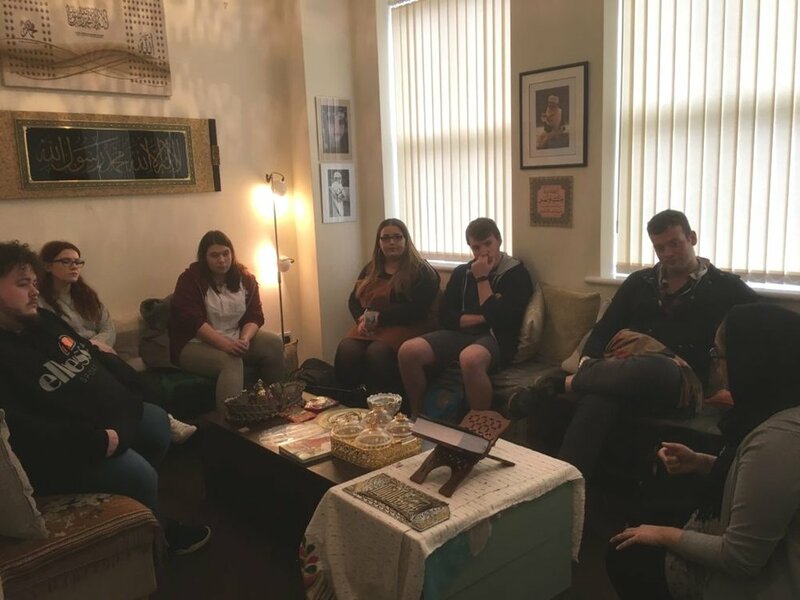 Hinnah and June Simms delivered sessions on Islam and Judaism using our re-created faith living rooms, the trainees thoroughly enjoyed these as their knowledge and awareness of each faith was increased by the end of the session. Matthew took the students on a tour of the Anglican Cathedral where they observed the Art. Alison delivered a practical session on the importance of RE and how RE and Art can be married together. Overall, the whole day was a success and we look forward to welcoming more trainee teachers soon! Friday 24th March (Week 1): Ethiopian and Caribbean themed session. We welcomed some new learners into our Home of Hospitality. They cooked some new Ethiopian dishes including a lentil stew (kuk wot) and made a very tasty Ethiopian smoothie called Spris. We discovered more in our Ethiopian living room and we even dressed up a little. We finished the day off with some gardening - thankfully the sun was shining. Friday 17th March (Week 6): Arabic/Islamic themed session. This week (sadly, the final week) learners cooked a delicious Arabic dish called Haneath. They also baked a date cake and made some Arabic lemonade - so fresh and revitalising! Hinnah did a very insightful session on Islam using our Muslim living room, we learnt lots about her practices and beliefs. 10th March: We had an amazing time at Springwood Heath Primary School where Hinnah and Sara Radivan delivered workshops for Year 4 and Year 6. The pupils learnt about Shabbat, Kosher, The Torah as well as the importance of many artefacts - they even got to try some delicious Challah bread. Hinnah and Alison went back into the school a few days later and delivered a British Values Assembly - both the pupils and staff throughoughly enjoyed this. Friday 10th March (Week 5): Mexican themed session. We learnt about the origins of hot chocolate and made some traditional hot chocolate with chilli. We are nearly finished with our staffs and excited to take them home. We learnt the La Cucuracha dance from our volunteer Anneka who comes from USA. 3rd March: Our Liverpool Round Table of Faiths and our Faiths in Our City book were the focus of a community lunch workshop run by Cathi Wareing (Children and Families Worker at St Luke’s Walton) as part of the Faith2017 project promoting better inter-faith encounter and understanding in communities that run the length of Queen’s Drive Liverpool. 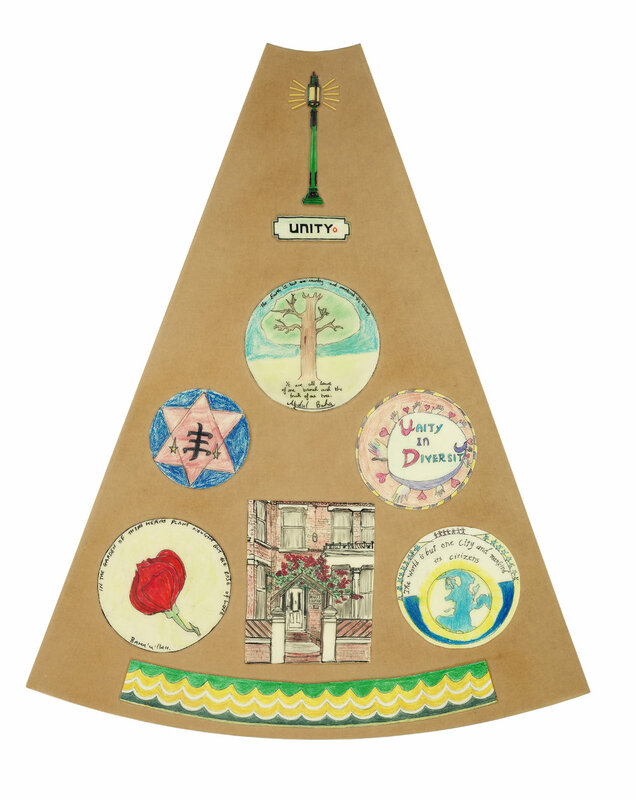 Our Round Table of Faiths comprises 9 panel, each containing drawings of key values and symbols and important Liverpool places of interest linked to each of the faith communities (to find out more please click on our 'Round Table of Faiths' tab found on the navigation bar above). Cathi reported that It was very well received and stimulated much discussion and interest, particularly around the symbols which we had included on each panel (the meanings of which are explained in our Faiths in Our City book). One lady knew the Baha’I Centre on Langdale Road very well, her mother was a personal friend of Dr Ernest Miller who donated the houses to the Baha’I community, and she had fond memories of him. Another lady was intrigued by the Rasta faith panel which features a drawing of Waverley Road and was puzzled about the Rastafarian connection. Through the Faiths in Our City booklet Cathi was able to show her that Haile Selassie’s son lived in a house their when he was studying at Liverpool University. This faith panel also has a drawing of the Adelphi hotel and the book explains that the Emperor stayed there when he came to visit his son. Cathi concluded “The main message received from the Table of Faiths workshop was how diverse Liverpool is as a city is and how that diversity contributes to creativity that is both colourful and tolerant”. 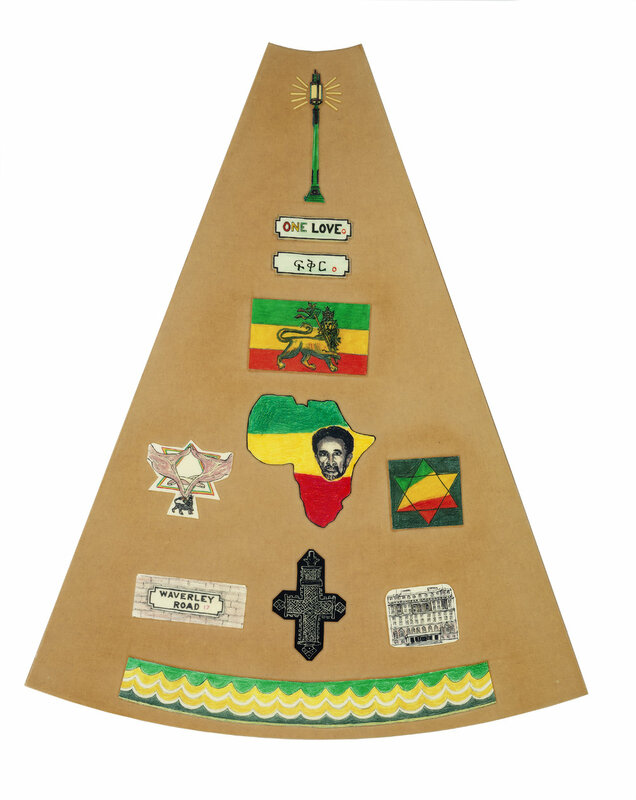 Friday 3rd March (Week 4): Ethiopian and Caribbean themed session. Learners made some new Ethiopian dishes including a tomato salad and a lentil wot (stew). We visited our Ethiopian living room to discover more of this uniquely rich culture. Learners worked hard on their staff, personalising them with words and designs that reflect their core values and cultural heritage. Thursday 2nd March: HMP Styal: Taste of Life week 2: Ethiopian week: another learner joined the course this week making a total of 7. We cooked a delicious Ethiopian lunch, freshly squeezed orange and carrto juice, jerk chicken and corn bread. Learners explored Ethiopian culture and history through our collection of artefacts from Ethiopia. Learners also reflected on inspirational stories and the life of Nick Vujicic. Friday 24th February (Week 3): We enjoyed cooking a delicious Meatloaf for Jewish week. We spent some time learning about Jewish culture and traditions in our Jewish living room. Our staffs are coming along nicely - the design phase has begun. We are very happy to be involved with this year's initiative, co-ordinated by Alsop High School, which involves a series of events, talks, visits, workshops and social action projects. We will be putting on two Year 7 educational events as part of the programme, one Faith Encounters Workshop in April at Alsop High School and one interactive workshop, here at Lady Chapel Close, in July. The aim of FAITH 2017 is to establish and develop relationships within and between different communities and different faith traditions and to inspire and empower young people to dream of a better future and equip them with the skills to take responsibility and play an active role in their communities. Sammi's final Youth Council Meeting and Leaving Do! We are all really sorry to see Sammi go. We would like to thank her for all her hard work and dedication she has put into the Youth Council, as well as Taste of Life, over the past 3 years. We wish her well in her future career and she will be greatly missed. We enjoyed a lovely lunch at one of Sammi's favourite restaurants: The Quarter. Alison and Hinnah had a great day at The Liverpool Metropolitan Cathedral celebrating their graduation, having gained their Masters in Education & RE. The office will be closed from 4pm on Wednesday 21st December until 9 am on Wednesday January 5th. We would all like to wish you a very Merry Christmas and a Happy New Year. 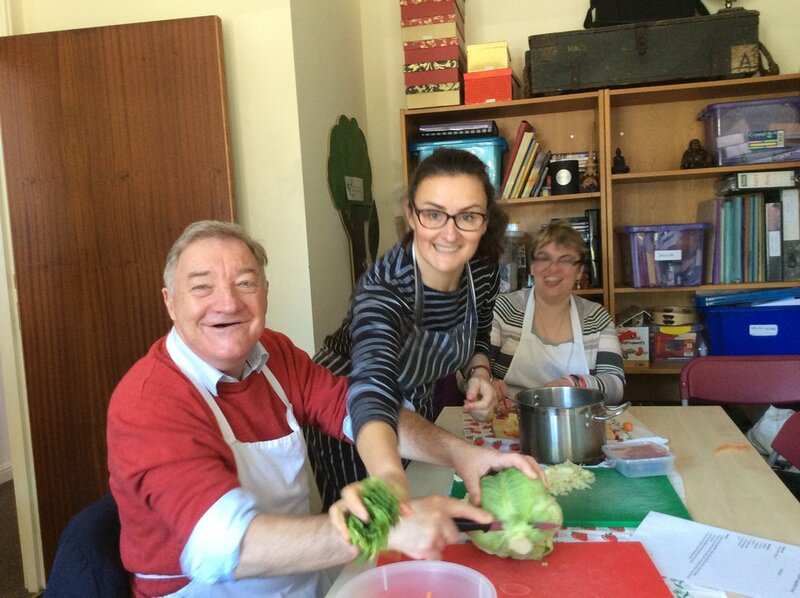 The dates for our unique well-being and personal development course for adults, which nurtures understanding of different faiths and cultures and combines cooking skills, horticultural skills and woodcraft, have been announced. Please contact us if you would like to come on the course, or if you are in contact with someone who you think might benefit. The course runs every Friday 10am - 1.30 pm and is funded by the NHS Healthy Liverpool Community Grant. Call us if you would like to book onto this FREE course. Oh what a good and joyful thing it is when brethren dwell together in unity! And that's exactly what we did! This year we hosted our end of year event at St Bede's Church, Toxteth. This was a great opportunity for everyone involved in LCS over the last year to celebrate their achievements. Learners, volunteers, youth council members, friends of LCS, partner organisations, steering committee members and trustees all enjoyed the annual event. Indian food and traditional Indian dancing was provided by Purvi Parikh. We welcomed nine senior staff from Regenda Homes from all over the North West to Liverpool Community Spirit for an Awareness Training Day. The aim was to raise awareness of different faiths in the welcoming environment of our Home for Hospitality. This was in line with their Equality and Diversity Project. Staff met members of the Muslim, Christian and Jewish communities and had a guided tour of Al Taiseer Mosque. They were treated to a cultural lunch of stuffed vine leaves, hummus, stuffed paratha, samosas and baklava. Everyone enjoyed the day and one person commented that it was so "different to a normal training day". 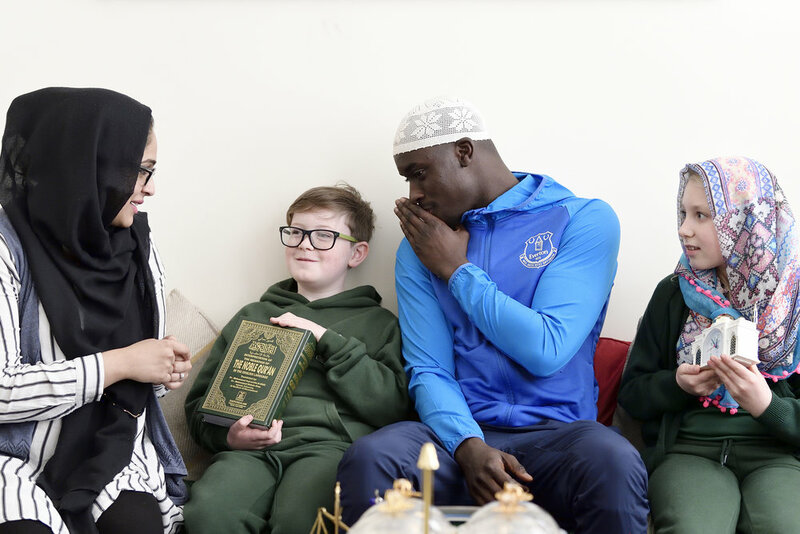 Everyone enjoyed meeting real people living out their faith, as a way to understand religion better and they felt very welcomed and looked after in a home environment. Several of the people attending wished that other staff in their organisation could benefit from this high quality training as it was so useful. "“I found the most useful thing is that I now have a better understanding of different religions”. Staff from Regenda Homes learning about Judaism from Sara, a member of the local Jewish community, in our Home of Hospitality. Over 100 teachers gave up their Saturday for a stimulating and informative day. 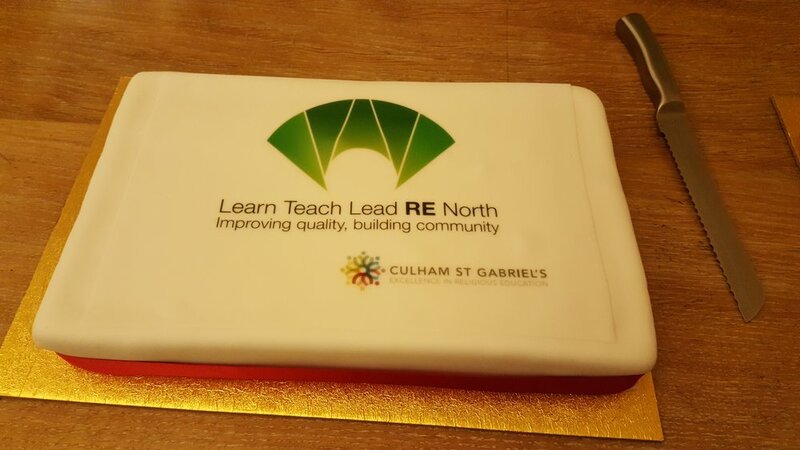 The LTLREN is a new initiative funded by Culham St Gabriels Trust. It seeks to transform RE teaching in primary and secondary schools, collaborating in continuing professional develop in eight areas (Cheshire East, Cheshire West, Halton, Wirral, Liverpool, St Helens, Warrington and Wirral). Affordable (i.e. free!) resources to use in the classroom. 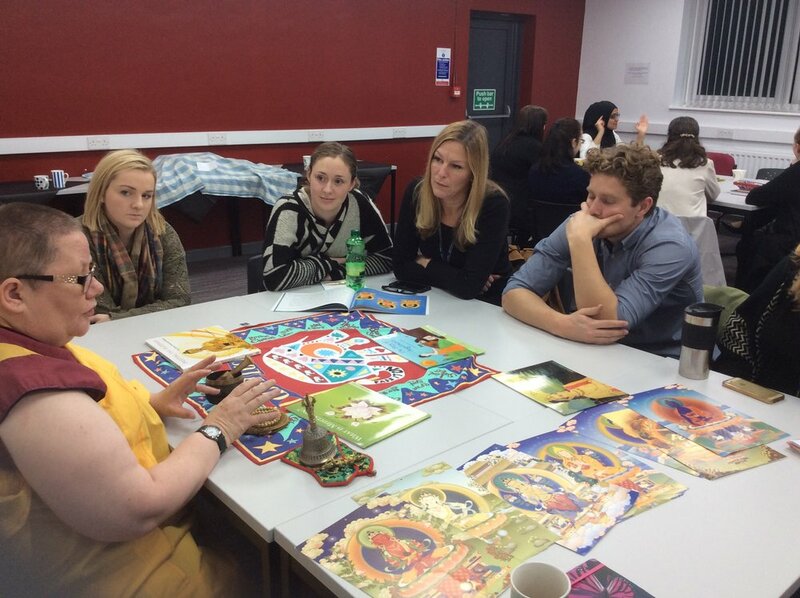 Teachers took part in a carousel for a ‘Living Islam Workshop’. This covered four vital aspects of Islam: the importance of Zakat and Hajj, diversity within Islam, the role of the Mosque and birth and marriage ceremonies. The carousel was delivered by four members of the Islamic faith, all with a teaching background. We helped organise and deliver an INSET day at Alsop High School, Walton for approx. 60 Secondary R.E. teachers from schools across Merseyside. Joy Schmack delivered a stimulating key note talk which was followed by our round table encounters with representatives of eight diverse faith communities. New reps included a Humanist, an Evangelical Christian and an Anglican Christian. We had excellent feedback from the teachers. Secondary school teachers taking part in the R.E workshops during the Inset Day at Alsop High School. 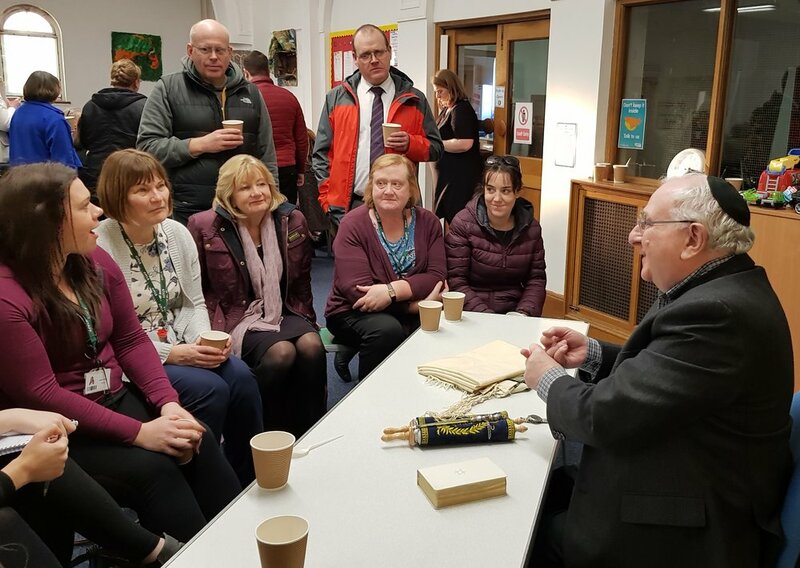 YC members welcomed LFC Chaplain and Minister at Bridge Chapel Bill Bygroves into the Faith living-rooms at the Liverpool Community Spirit offices. Bill was a great guest speaker, talking to Youth Council about his Faith and what it means to him. Members and friends enjoyed a fun filled day of activities at the event. Week 3 of Cultivating Community Spirit with our lovely learners from Making Days. Our theme today was Ethiopia and our first attempt at making Doro Wot (chicken stew) was a resounding success! Learners on the Cultivating Community Spirit gardening course did a great job of decorating terracotta plant pots with spring designs. Next week we will be filling them with compost and planting some lovely herbs and flowers. Youth Council members leading the closing ceremony for The Heartstone Odyssey project at The Liverpool Anglican Cathedral. The group of learners on our CCS course worked really hard today on the designs for their staffs as well as cooking and enjoying a delicious Thai green curry and roti breads. The first Taste of Life course of 2016 started today. Ian and Anthony below posing with the corn bread they baked! It was such a great night! The atmosphere was vibrant, the food delicious and the ceilidh a lot of fun! 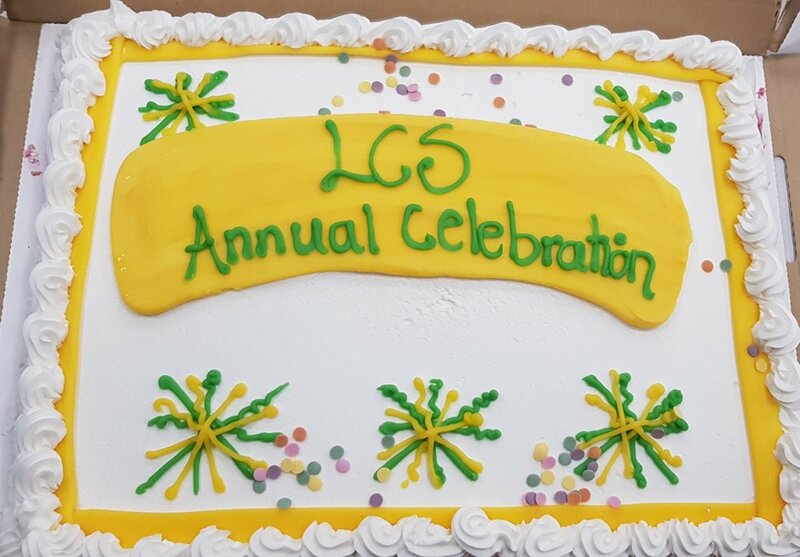 The LCS team would like to say a big thank-you to everyone who came along to join in the celebrations at our yearly event. The learners on our Cultivating Community Spirit enjoyed reading and discussing the book 'The Always Prayer Shawl' as well as learning about some Jewish artefacts and preparing (and eating!) delicious chicken soup and Challot (mini Challah breads). Youth council members attended a Skills and Invention presentation by professional artist Richard Meaghan and viewed what goes on behind the scenes at his Art studio in Liverpool. Some of the adult learners from our most recent Cultivating Community Spirit and Taste of Life courses enjoyed a visit to the Anglican Cathedral where they had a meeting with the Dean and braved the long climb up the tower for breathtaking views of Liverpool!